I’m particularly interested in geometric shapes that represent nature. 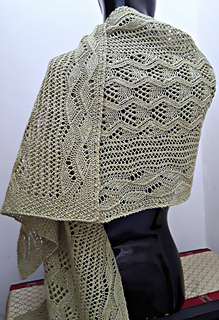 This lace knit wrap design features a center panel of a repeating arbor lace stitch pattern surrounded by a Turkish faggoting stitch, and edged on both sides with a stylized leafy vine stitch pattern. The inspiration for the design came as I was walking through a formal garden in Europe last year. The linen/wool blend of Blacker Lyonesse provides excellent stitch definition for this pattern. 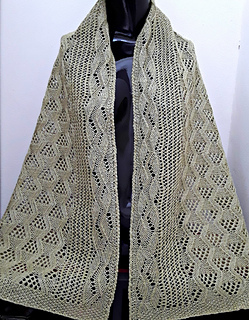 I used 4 skeins in the color Citrine for the shawl as shown. Note that both written and charted instructions are included.